Google Analytics is by far one of the most important tools you need to use when running an ecommerce store – without it, you miss out on vital information about your store and visitors. As it’s so important, we’ve made it really quick and simple to add your Google Analytics tracking code to your OpenCart store – without the need of a web developer! Firstly, you’ll need to create a Google Analytics account and generate a tracking code for your website. If you already have a Google Analytics account set up for your website then skip to step 3 to see how to add your tracking code to your OpenCart store. You’ll then be taken straight to your tracking ID – if you click off this page, you can find it again by going to the Admin tab > Tracking Info > Tracking Code. 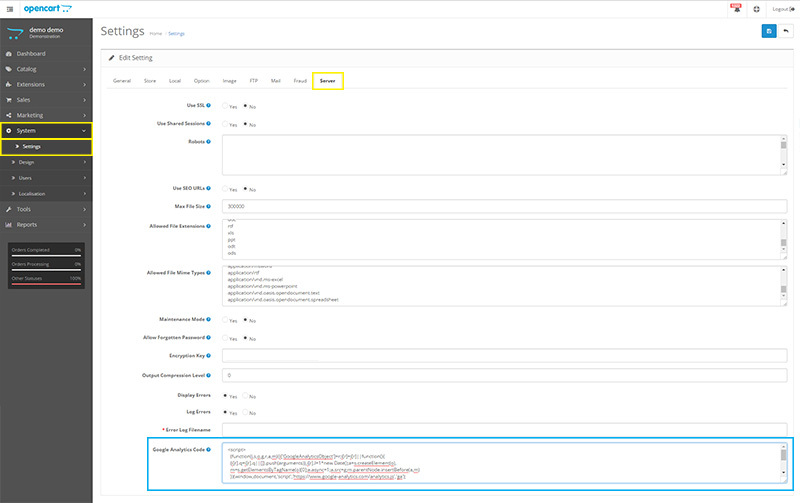 The full Google Analytics tracking code with your unique ID code is shown in the “Website tracking” (highlighted below in blue) box. Copy this code and go to your OpenCart store’s admin area. In your store’s admin area, navigate to System > Settings > edit the store you wish to add the Google Analytics tracking ID to. In the “Server” tab, scroll to the bottom until you see the “Google Analytics Code” field and paste your tracking code into this field. Click save at the top right and you’re done! To test that your tracking code has been set up correctly, go to your Google Analytics account and view the “Reporting” section. In Real Time > Overview you will be able to see a live number of users on your site – remember, there may be a delay in them showing in the rest of your Google Analytics data so check the Real Time section first.